On January 12, 2000, a Notice of Intent (NOI) to prepare an Environmental Impact Statement/Environmental Impact Report (EIS/EIR) for the Restoration Project was published in the Federal Register. The NOI includes the notice of a public scoping meeting held on January 31, 2000, in Manton, California. During this meeting, the public was presented with an overview of the Restoration Project, including the purpose of and need for the project, a project description, and the current project alternatives. Written and oral comments were received from the public at this meeting and were summarized in the Battle Creek Scoping Report. These comments were considered by Reclamation in determining the scope of the EIS/EIR. On July 18, 2003, the Draft EIS/EIR was released for a 90-day public review and comment. On August 27, 2003, oral and written comments on the Draft EIS/EIR were received at a public hearing in Manton, California. Comments received during the public review period and at the public hearing are addressed in the Final EIS/EIR. Two public information workshops were held in Manton, California, on July 23 and August 12, 2003, to discuss the content of the Draft EIS/EIR and the public comment process. 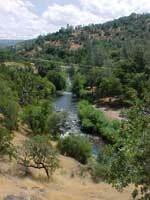 On March 15, 2004, a public meeting was held in Red Bluff, California to discuss and compare the Draft EIS/EIR Proposed Action to an eight-dam-removal scenario. Numerous comments addressing a wide range of issues were received on the Draft EIS/EIR, with some warranting circulation of supplemental/revised information to the original joint document. The Draft Supplemental EIS/Revised EIR became available for public comment in early 2005, and the Final EIS/EIR was issued in July 2005. In 1995, a working group (now the Greater Battle Creek Watershed Working Group [GBCWWG]), was formed by representatives of governmental resource agencies and fishery, environmental, local, agricultural, power, and urban stakeholder communities. It was established by interested and affected parties associated with the implementation of the Central Valley Project Improvement Act (CVPIA) to develop an implementation plan for Battle Creek that was effective and acceptable to the community. The primary objective of the GBCWWG includes establishing a transparent, balanced, collaborative, respectful, and inclusive forum for communication on issues affecting the Battle Creek Watershed. Flow determinations identified in the 1999 Restoration Project MOU were initially developed by the Battle Creek Working Group biological technical team. In 1997, a group of local landowners organized to form the Battle Creek Watershed Conservancy (BCWC). Since itsinception, the BCWC has contributed significantly to restoration and conservation efforts within the greater Battle Creek watershed. In 1999, the BCWC prepared the Battle Creek Watershed Community Strategy, a long-term plan developed as a response to the Restoration Project. The strategy is the result of extensive public input from many community meetings and reflects the concerns and goals of local stakeholders regarding the Battle Creek watershed. It emphasizes strategies and actions to support the restoration of Chinook salmon to Battle Creek and the continuation of a healthy, fully functioning watershed. Recognizing the stewardship responsibilities that all landowners assume within the watershed, the strategies emphasize "on-the-ground" actions and best management practices to ensure the continued health of the watershed. The BCWC prepared the Battle Creek Watershed Assessment Report, which describes the ecological state of the Battle Creek watershed and the historical roles it has played, particularly in the development of hydroelectric power and fish culture.